KOD FX is based on DNA polymerase from the hyperthermophilic Archaeon Thermococcus kodakaraensis KOD1(1)(2). KOD FX results in much greater PCR success based on efficiency and elongation capabilities than KOD -Plus- or other Taq-based PCR enzymes. 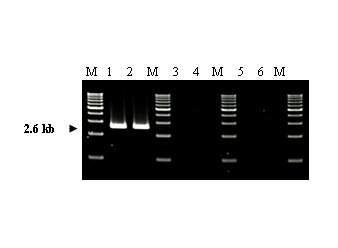 KOD FX enzyme solution contains two types of anti-KOD DNA polymerase antibodies that inhibit polymerase and 3'→5' exonuclease activities, thus allowing for Hot Start PCR(3). 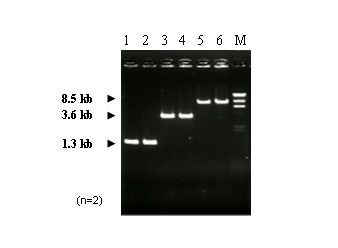 KOD FX generates blunt-end PCR products, due to 3'→5' exonuclease (proof-reading) activity. Effective for the amplification of GC-rich targets and crude samples. 40kb from lambda phage DNA, 24kb from human genomic DNA, and 13.5kb from cDNA. The PCR error ratio is about 10 times less than that of Taq DNA polymerase. Table I. Comparison of the mutation frequency of each PCR enzyme. (2.4kb of the human bata-globin region), about 96 clones were selected and sequenced. *The enzyme solution contains anti-KOD DNA polymerase antibodies that neutralize polymerase and 3'→5' exonuclease activities. ** 2× PCR Buffer for KOD FX is a liquid (not congealed) when in storage at -20°C. Although it does congeal below -20°C, the quality is not affected. cases, amplification efficiency or reliability may be decreased (See Example 3). -Because this enzyme possesses an extremely high amplification efficiency, 25~30 cycles usually give sufficient amplification. For a low-copy number target, or over 10 kb target length, 30~40 cycles are recommended. 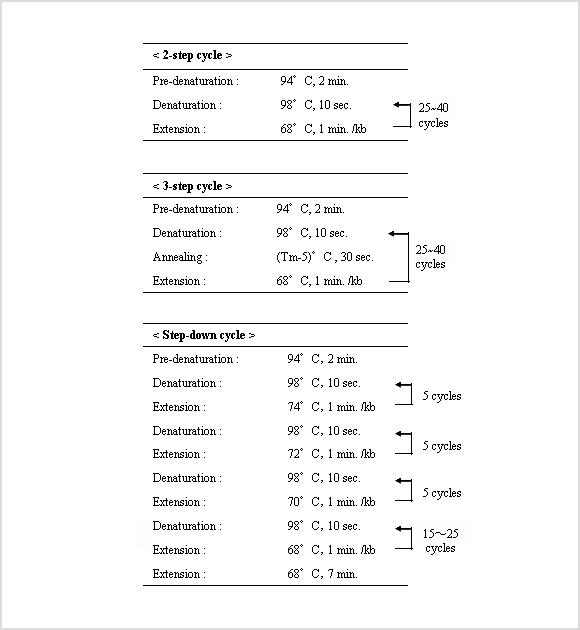 -The step-down cycle condition is effective for trouble shooting a smear amplification in a long-distance PCR(>10kb). 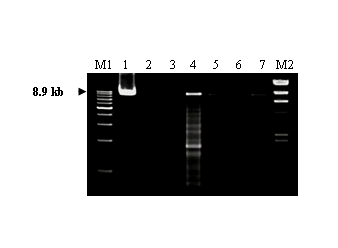 Mouse membrane glycoprotein (Thy-1) gene was amplified using various PCR enzymes from a mouse tail lysate prepared by the alkaline lysis method. As a result, KOD FX could successfully amplify the target whereas the other PCR enzymes gave no amplification bands. 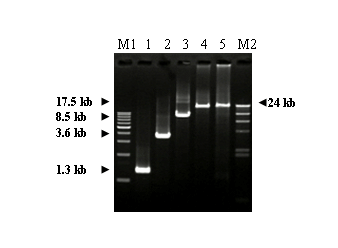 The GC-rich target, human IGF2R (8.9 kb) was amplified using various PCR enzymes. This gene contains very high GC-rich regions (CG content = 90%). KOD FX successfully amplified the target. Various lengths of β-globin targets were amplified from cultured cells (Jurkat cells). The target genes (1.3, 3.6, and 8.5 kb) were successfully amplified using KOD FX. The long-target amplification capability of KOD FX was evaluated by amplifying β-globin genes ranging in size from 1.3 to 17.5 kb. As a result, distinct bands were successfully amplified from genomic DNAs by KOD FX.